Frigidaire's FFRA0511Q1 5,000 BTU 115V Window-Mounted Mini-Compact Air Conditioner is perfect for cooling a room up to 150 square feet. It quickly cools a room on hot days and quiet operation keeps you cool without keeping you awake. This unit features mechanical rotary controls and top, full-width, 2-way air direction control. The antibacterial mesh filter with side, slide-out access reduces bacteria, room odors and other airborne particles for a healthier, more comfortable environment. Low power start-up conserves energy and saves you money plus, effortless restart automatically resumes operating at its previous settings when power is restored. 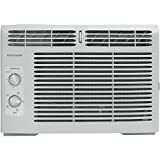 Frigidaire FFRA1011R1 10,000 BTU 115V window-mounted mini-compact air conditioner is perfect for cooling a room up to 450 square feet. It quickly cools a room on hot days and quiet operation keeps you cool without keeping you awake. This unit features mechanical rotary controls and top, full-width, 8-way air direction control. The washable filter with front, tilt-out access reduces bacteria, room odors and other airborne particles for a healthier, more comfortable environment. Low power start-up conserves energy and saves you money plus, effortless restart automatically resumes operating at its previous settings when power is restored. 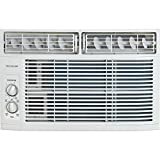 Frigidaire FFRA0611R1 6,000 BTU 115V window-mounted mini-compact air conditioner is perfect for cooling a room up to 250 square feet. It quickly cools a room on hot days and quiet operation keeps you cool without keeping you awake. This unit features mechanical rotary controls and top, full-width, 8-way air direction control. The washable filter with front, tilt-out access reduces bacteria, room odors and other airborne particles for a healthier, more comfortable environment. Low power start-up conserves energy and saves you money plus, effortless restart automatically resumes operating at its previous settings when power is restored. Frigidaire's FFRA0811R1 8,000 BTU 115V Window-Mounted Mini-Compact Air Conditioner is perfect for cooling a room up to 350 square feet. It quickly cools a room on hot days and quiet operation keeps you cool without keeping you awake. This unit features mechanical rotary controls and top, full-width, eight-way air direction control. The washable filter with front, tilt-out access reduces bacteria, room odors and other airborne particles for a healthier, more comfortable environment. Low power start-up conserves energy and saves you money plus, effortless restart automatically resumes operating at its previous settings when power is restored. 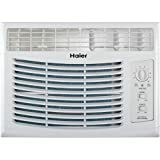 The Haier HWF05XCL 5,000 BTU 115V Window-Mounted Air Conditioner with Mechanical Controls is designed for a room up to 150 square feet. Two modes include Cool for cooling the air and Fan to circulate the air. Choose from 2 cooling speeds (high, medium or low) and 2 fan speeds (high, medium or low). Additional features include 2-way air direction to direct the air where you want it and an easy-access washable mesh filter. Plus, the quick install window kit assembles to the unit in minutes for hassle-free installation. 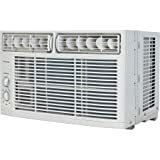 Frigidaire's FFRA0511R1 5,000 BTU 115V Window-Mounted Mini-Compact Air Conditioner is perfect for cooling a room up to 150 square feet. It quickly cools a room on hot days and quiet operation keeps you cool without keeping you awake. This unit features mechanical rotary controls and top, full-width, 2-way air direction control. The washable mesh filter with side, slide-out access reduces bacteria, room odors and other airborne particles for a healthier, more comfortable environment. Low power start-up conserves energy and saves you money plus, effortless restart automatically resumes operating at its previous settings when power is restored. 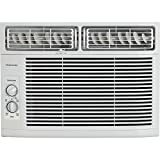 Frigidaire's FFRA0811R1 8,000 BTU 115V Window-Mounted Mini-Compact Air Conditioner is perfect for cooling a room up to 350 square feet. It quickly cools a room on hot days and quiet operation keeps you cool without keeping you awake. This unit features mechanical rotary controls and top, full-width, 8-way air direction control. The washable filter with front, tilt-out access reduces bacteria, room odors and other airborne particles for a healthier, more comfortable environment. Low power start-up conserves energy and saves you money plus, effortless restart automatically resumes operating at its previous settings when power is restored.